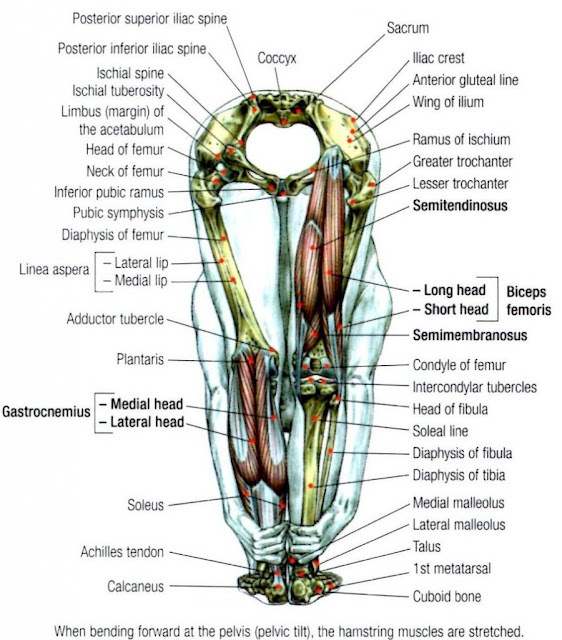 Category Archives for "hamstring stretches"
To start your Hamstring Stretching do a few jumping jacks or running in place to warm up your muscles. For your first Hamstring Stretching exercise stand on one leg with your knee slightly bent, your other leg out in front by about one foot, knee held firmly in place, bring the toes up towards your shin (dorsiflexion). Then place one hand on each of your thighs, elbows bent, with your back arched forward, slowly continue to bend your upper body (torso) forward, focus on the feeling in your hamstring. Do not bounce, but continue to tilt your upper body forward slowly until you are not able to bend it any further, hold for a count of 10 to 20, return to starting position. 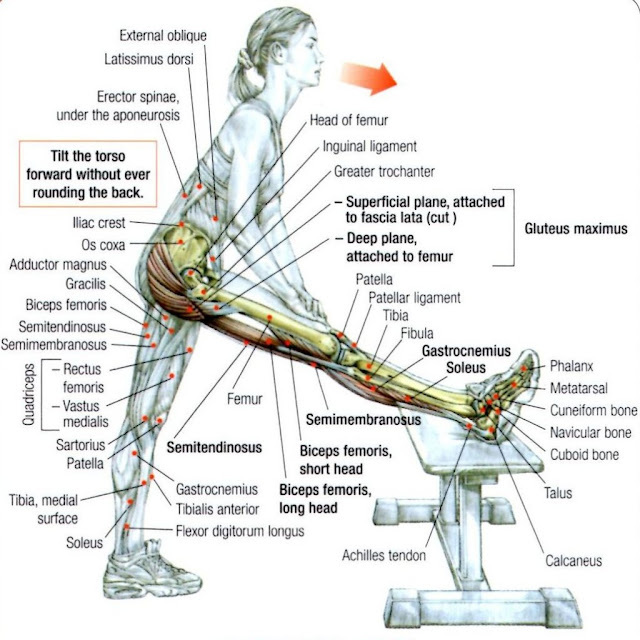 Here we advance to a little more stretching of the Hamstrings by placing one leg on a bench or a bar. Stand in a similar position as above, placing the heel of the foot of the leg to be stretched on a bench or bar. In the beginning relax the foot and the shin muscles, knee straight (but not locked). Tilt forward at the pelvis feeling the stretch in the hamstring, hold for a count of 10 to 20, then return to your upright position. As you advance in this Hamstring Stretching exercise, you will pull your toes up closer to your shin (dorsiflexion), this will add additional stretching to your hamstring, as well as the calf muscles. As you continue to advance you will move on to the touching of the toes. Starting from standing erect, slowly bend your torso forward until you fingertips are touching the floor. 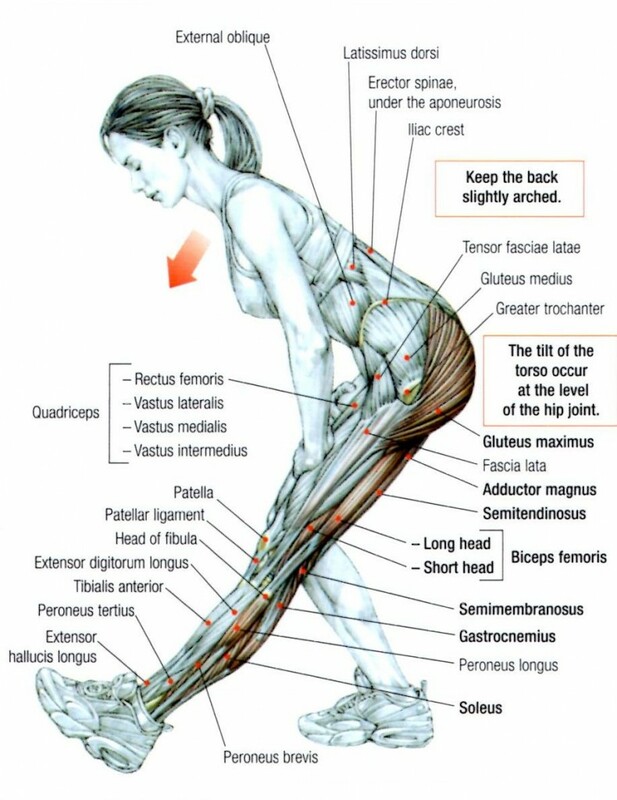 Think about relaxing your entire body as you do this Hamstring Stretching exercise. Once you have achieved the furthest of your reach towards your toes, with each hand grasp the back side of your leg and gently pull your torso closer to your legs, hold for a count of 10, repeat 3 to 5 times. With continued practice you will eventually be able to grasp the back of your ankles, bringing your nose to your knees. Do not push this, it takes time and practice, but this is your goal. As with all stretching exercises you should be able to feel equal tension (ie. each hamstring muscle), this is a goal to have equality in your muscle flexibility. Remember to always do these stretching exercises gently and slowly, this will accomplish our goal of building stronger and more flexible muscles, and assist us in preventing injury as we take up exercises and sports.